Parts of the Greenwich Peninsula have been redeveloped in recent years, with the O2 the most high-profile new development on the peninsula and some others to follow, including the Emirates Air Line cable car to the Royal Docks. Gradually the areas to the east of the peninsula are being developed, with a commercial heart around the tube station slowly emerging, and with fairly advanced plans for more development around the top of the peninsula, including AEG’s planned hotel. The western side of the peninsula, however, has remained strictly industrial until recently, but the sands are beginning to shift. The first residents are living in the Lovells Wharf development closest to Greenwich, and the Enderby’s Wharf proposals – complete with a cruise ship terminal capable of handling ships up to 240 m long – gained planning permission a while ago and could come forward soon. 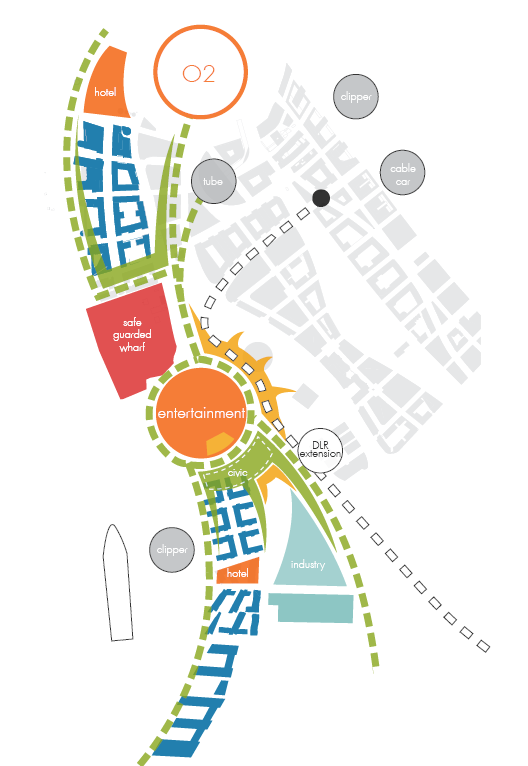 With all this activity in the area, the London Royal Borough of Greenwich has produced a new masterplan for the western part of the peninsula, to set out some planning parameters for the new developments which will over time edge out the current industries, if the borough has its way. The council is seeking comments on the draft until the 9th March. 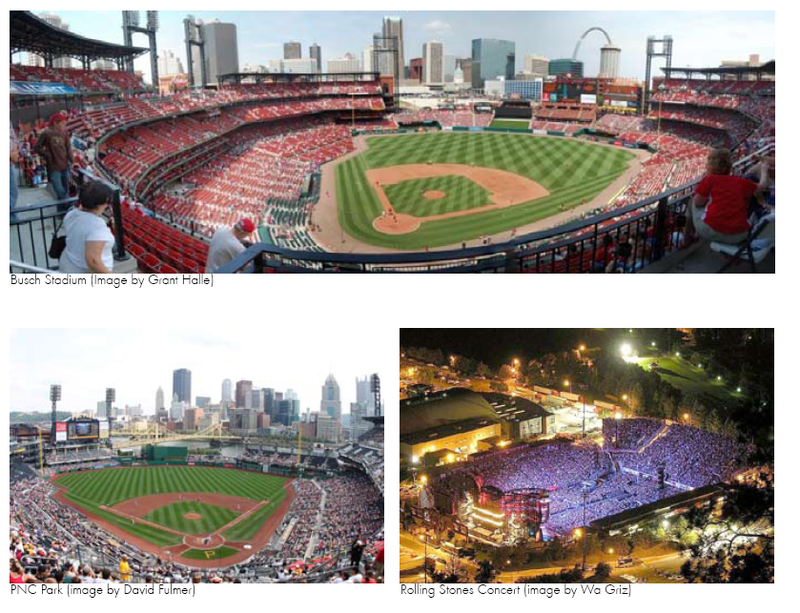 For me the stand-out feature of the masterplan is that it’s been planned around a new 40,000 seat arena, seemingly based on American baseball grounds in concept (or at least, that’s how it’s being presented). This would be an open bowl, with the main stands to the south and east and open views towards Canary Wharf. This would seemingly be principally for open-air concerts, and there is some logic to this; AEG – operators of the nearby indoor O2 Arena – clearly think there is a market for outdoor concerts, as this was a part of their failed bid for the Olympic Park, and they are installing a temporary venue on the peninsula for summer 2012. In addition, there has very recently been a row over concerts in Hyde Park, so a purpose-built venue for such gigs could clearly have a place in London’s summer calendar. However, you have to wonder whether one of London’s many existing stadia could perform this function, and indeed whether the plans for lots of residential property next door rather undermines the ability to play loud live music. And it seems to me that this can’t possibly be sufficient reason to build such an expensive arena. So what of other uses? The documents refers rather obliquely to the arena being “integrated with an elite sports facility” – or, in plain English, maybe it would be used by a professional sports team. Whatever could they mean? The examples in the document are baseball arenas, but with the best will in the world I can’t see professional baseball taking off here any time soon, even though I got to quite like it when visiting the States and enjoyed a day out at the old Yankees stadium before it was knocked down. The oval shape would be well suited to cricket, and perhaps Kent could be persuaded to play some Twenty-20 cricket here – south east London is underserved by the traditional county, and Kent have shown an interest in playing in London, with a home game at the Oval in 2010 and even showing some interest in the Olympic stadium. Unlike those venues, this is within the traditional county of Kent (who have in the past played locally at Blackheath) so perhaps this would work. But one or two Twenty-20 games a year isn’t going to pay the rent any more than some outside gigs, and they’d be competing for the best summer weather. With respect to the historic Blackheath rugby club nearby, rugby’s not a very south east London sport and doesn’t pull in the sort of crowds which would be at home in a venue of this size. Which pretty much leaves football. As luck would have it, there is a professional club not far away in the form of Charlton Athletic. Due to their travails in the 1980s which saw the club forced out of the Valley and having to groundshare at Selhurst Park and then briefly Upton Park, the fans of Charlton are probably even more attached to their home than most fans, but in this day and age it’s becoming more accepted that at times a move can be justified. So would Charlton be in the market for a new ground? It isn’t immediately obvious why they should be; the Valley is a pretty good ground, three of the four sides have been rebuilt since their return 20 years ago, and the 27,000 capacity is rarely met at present. However, that 27,000 capacity is not perhaps as generous as it sounds; the club are currently in League One, and this is likely to be a temporary situation. Just the other day, a Football for a Fiver promotion brought a sell-out crowd of 26,500 (allowing for segregation) against Stevenage. The club have advanced plans to extend the Valley to 40,000 to cater for larger crowds, but this is expensive and doesn’t come without difficulties. For starters, the transport capacity getting away from the Valley on a matchday is limited, with crowd control at the station and very busy roads. 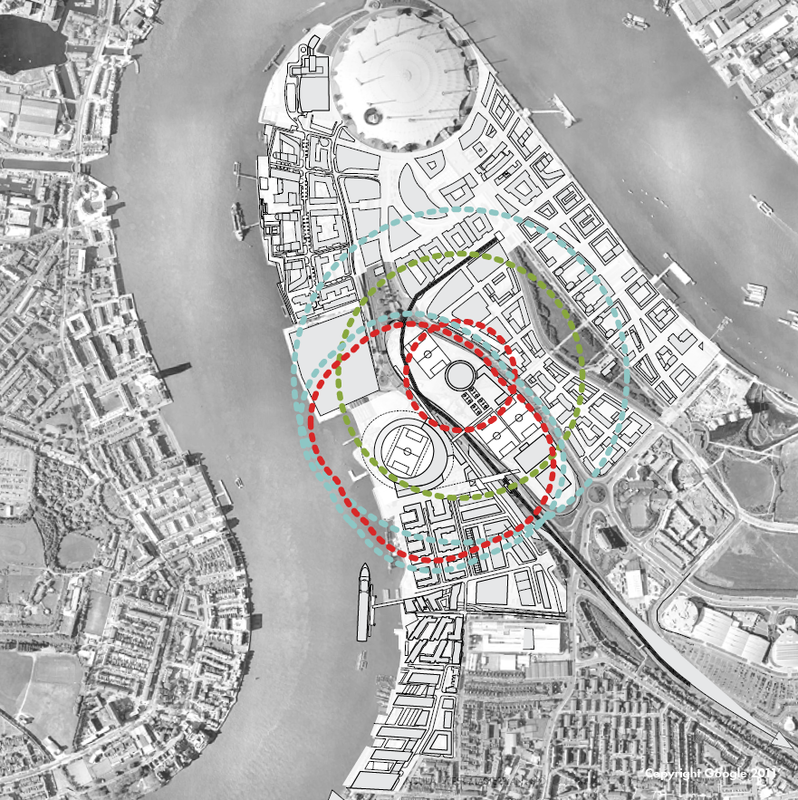 A new home on the Greenwich Peninsula would take the club out of Charlton, but only marginally, and would still be in the borough of Greenwich. The ground would still be within walking distance of the same railway line through Woolwich, albeit with a longer walk, and without the odd Blackheath line train. But there would also be the option to walk to North Greenwich for the tube (admittedly of less use for local fans but perhaps handy for some, and certainly away fans) and for lots of buses through SE London, and to walk into Greenwich for the DLR to head south. There is lots of parking for the O2, which could probably be used on a matchday provided no major events coincided, and there is a coach station nearby. I have no idea how the finances would stack up, as I cannot imagine that the sale of the Valley would come anywhere near the cost of a new stadium, even when the extra capacity is added in; but perhaps the stadium is the catalyst which would unlock the surrounding land for the more profitable business of home building, and the extra concerts and no doubt hospitality would all contribute additional sources of revenue which could help to get it off the ground. I’ll be watching this one eagerly. The plans also show Greenwich’s plans for a DLR extension towards Eltham. I have some sympathy for the concept of extending a line to the south east – south east London is under-served by public transport compared with other areas, and most of the railways by-pass Docklands and head straight for central London, putting a lot of pressure on those links which do run south (like the Lewisham DLR branch). But I’m not entirely convinced by this scheme as drawn by Greenwich; it would be hugely expensive (about £1 billion), and yet still wouldn’t provide a direct link to Canary Wharf, as once it gets to the Greenwich Peninsula, it heads for Canning Town (or even West Silvertown, if the terrible rail plan in this document is to be believed). This would simply pile more people onto the very busy Jubilee line for one stop. If you’re going to go to the trouble and expense of building a light railway up to the Greenwich Peninsula from the south east, at least turn left instead of right when you get there, and drop people off at Canary Wharf – put a station below the southernmost West India Dock, just as the Jubilee line and Crossrail stations are built on the site of the other docks. And while you’re at it, keep going to serve the Rotherhithe peninsula and Canada Water to relieve the Jubilee line some more and link to the Overground for a really useful link.